Almost ARDE LUCUS Festival Time! It is almost time for the historic celebration of the city LUGO and the festival known as ARDE LUCUS. 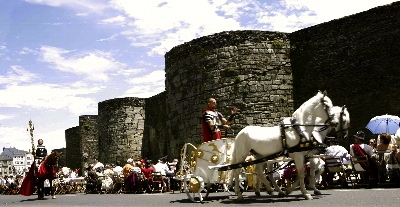 The city will be alive with FESTIVITIES and people in Celtic, Castrexo and Roman Costumes, music, ancient traditional open air market, arts & crafts, delicious food and wine and of course some 150 exciting events that will take you back in time – we hope you will join us June 14, 15 and 16, 2013. This entry was posted in Camino Travel Tips, Secret Treasures , Legends & Myths of Galicia, Secrets of Spain and tagged animals, architecture, camino, celebration, culture, events, festivals, music, outdoors, spirituality, traditions, wine. Bookmark the permalink. ← Camino Inspires Random Acts of KINDNESS!